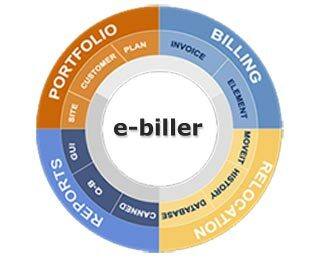 e-Biller is a fast, powerful and accurate web based billing solution. Its scalability and flexibility will provide telecom operators to remain competitive without additional overhead of software complexity. It is designed for change and growth.When implementing e-Biller, we are committed to transforming your billing process into a strategic marketing tool while reducing the billing cost and enhancing customer loyalty. e-Biller application allows telecom operators with versatility required by the organization to rapidly configure, implement new services, offers, ratings and schemes. It is a comprehensive package where the operator will get all the facilities under one roof. e-Biller gives you the ability to bring new products to market with unprecedented speed. Let's say, for example, that your marketing department creates a new campaign in which a number of your services and offers are bundled together as a new promotional package. Within minutes, authorized users create and define this new product package in the system using e-Biller's intuitive e-Portfolio administration features.e-Biller lets these entire activities take place literally within minutes of the new product package being conceived. With e-Biller, adding new Products no longer requires time-consuming specialized programming and regression testing, dramatically reducing your time to revenue. The marketplace of the future will feature only a few dominant players, each marketing and selling a diverse range of services and offers. This new marketplace began taking shape with the advent of deregulation, and is now being defined by the Internet economy. Companies are faced with the daunting challenge of constantly reinventing themselves, merging with other companies with different service lines, and engaging in more specialized and complex transactions with their customers . This emerging market demands a new solution, one that will allow companies to offer unlimited types of services and offers. The e-Biller Product Suite meets the needs of this convergent market head on. With e-Biller, you can define unique services and offers, market and sell those, and bill for them nearly simultaneously, dramatically reducing your time to revenue. Designed for the convergent marketplace and entirely web-based, the e-Biller Product Suite manages your entire front and back-office needs, from customer account creation and administration, to billing, rating and defining Tariff rules for commitment (MRC) with the most flexible billing system on the market today. You may not know what services and offers you may be providing in the future, but e-Biller is ready to help you take them from thought to revenue.